Some features in PowerPoint 2013 and newer versions are unavailable or behave differently when you open a presentation file in an earlier version of PowerPoint. 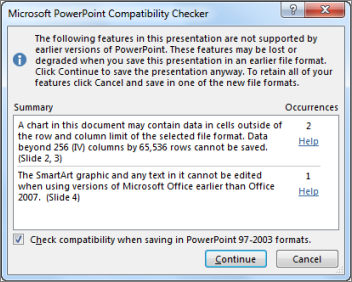 The screenshot below is an example of a compatibility checker alert that you could get if, for example, you created a presentation in PowerPoint 2013 (.pptx format), and then tried to save it in .ppt format. The table below includes certain features that are unavailable or degraded when you save a .pptx presentation in PowerPoint 97-2003 (.ppt) format. If the presentation contains a chart where the cells appear outside of the supported row and column limit, those cells will not be saved and will not appear. Soft, outer shadows are converted to hard shadows that you can edit. Heading and body fonts are converted to static formatting. That is, when you open the file in an earlier version of PowerPoint you cannot change the text or the style formatting. Some indentation levels are unavailable. If you add static guides to the slide master or to a layout in Slide Master view, the guides won't appear when opened in earlier versions of PowerPoint. Some themes with shapes and placeholders can change them into pictures, which you cannot edit. A transition effect first released in version 2013 won't be available earlier versions of PowerPoint. For related information, see Save a PowerPoint .pptx file in the .ppt format and Use compatibility mode to work with different versions of PowerPoint.